Bootstrap 3: Bootstrap is the most popular HTML, CSS, and JS framework for developing responsive, mobile first projects on the web. It has been adopted by many Joomla theme developers and it brings many improvements over the standard Bootstrap 2.3.2. Read More. SobiPro 1.2: In this new SobiPro version Sigsiu's team concentrated their efforts to refine the front-end output of SobiPro. 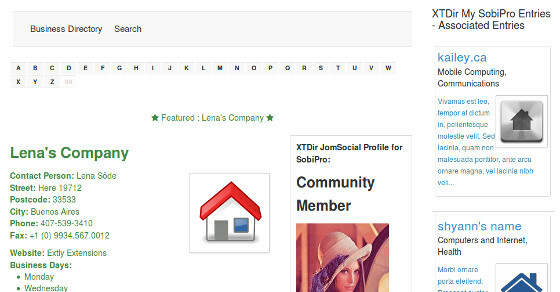 To adapt the SobiPro layout to the used Joomla! template, SobiPro 1.2 has the ability to switch off loading its Bootstrap and Icon fonts and use the ones from the template instead. It also brings new icon fonts, which can be loaded. To adapt completely to Bootstrap 3 output, SobiPro now has the possibility to switch its generated HTML output to Bootstrap 3 format. Read more. Beyond these outstanding features, we have taken the time to rewrite many features for speed and created a final package ready for mobile devices. The future looks bright and the times ahead are exciting. This is our new platform for mobile content management. We have already started rolling out and we intend to amaze you with every new release. Please, check the final list of features packaged in this beta release. Do not upgrade any of your production sites to the beta version as beta is ONLY intended for testing and there is no upgrade path from Beta.